January is the “summer of tennis” here in Melbourne, which meant I was “forced” to spend a considerable amount of time in front of the TV. It has also been a very hot month, so watching the athletes slug it out from the air-conditioned comfort of the couch made this an acceptable and rather enjoyable past time. Unfortunately, it also meant I was bombarded with the same ads during commercial breaks over and over again—something that tends to create a negative emotional response in me to the advertised product or service. As a dog trainer, I know all about negative emotional responses because I see them in dogs all the time. The responses can be to us, our actions, the things we do to our dogs, certain situations or anything in the environment that makes dogs fearful, anxious, annoyed or aggressive. It shows mostly in their body language. Does Training Your Dog Seem Like a Chore? Try the Opportunistic Approach. If you live with a dog, you will have your own negative emotional responses to the things your dog does or doesn’t do. But even the mere idea of training your dog can cause a negative emotional response, if you consider “dog training” a chore. If this is the case—if you feel you have little time or motivation to teach your dog—I may have some ideas for you. 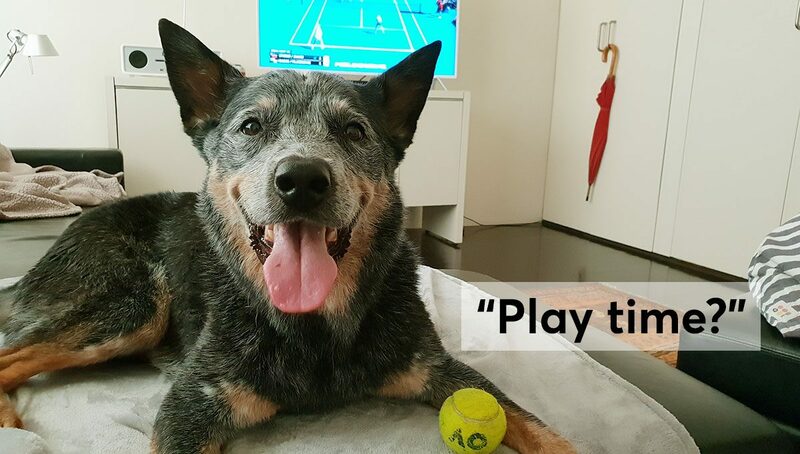 Whenever I was sufficiently fed up by those annoying interruptions to my tennis binge watching, I grabbed some treats and turned my focus to the dogs I was with. I call it my “quick & dirty Australian Open version of lazy dog training”. So, here are a few “on the fly” activities you can do with your dog whenever you have some down time. Be it TV ads or waiting for your pasta to cook, those brief times when you don’t quite know what to do with yourself offer an opportunity to do some fun stuff with your dog (or cat, or any animal for that matter). Before you know it, you may find you have actually taught your dog, and maybe yourself, some mighty useful skills. And, who knows, it may spark your interest in doing some more “methodical”—and more efficient!—dog training in the future. But if not, that’s totally OK too. Have a go. All you need is a container full of yummy treats and some toys within easy reach and you can train whenever and for as short a time as you feel like it. Even without getting up from the couch, you can teach your dog some basic things, such as being patient. It will probably come as no surprise that patience is not in your dog’s natural repertoire. And it’s even worse, if you haven’t taken your dog out to the park or for a walk yet. Under-exercised dogs and impulse control do not go well together. Fortunately, if you can play fetch and tug with your dog from the couch, you can teach them to control their impulsiveness at the same time. The key is to start easy. Before you throw a toy or start the tug game, ask your dog to wait for just one second. Any attempt by your dog of jumping at and grabbing the toy results in a delay of play until your dog manages to hold back for one second only. Just hold the toy at a distance (e.g. above your head) where they can’t get to it or move the toy out of the dog’s reach every time they try to grab it. Once your dog pauses for one second, quickly start the game: Throw the toy/ball for the dog to fetch or start a game of tug by making the tug toy move away from the dog. One second is all you need to get your foot in the door and, most importantly, it sets your dog up for success. The opposite—trying to get the dog to wait longer than they are able to and possibly adding verbal reprimands such as “no!” or “ah ah!” when they try to grab the toy—will only lead to frustration, and possibly intimidation, and your dog may not want to play at all anymore. When your dog is good at pausing for one second, you can throw in some two or three second pauses. This is all you need for many day-to-day applications, such as opening doors without the dog rushing through, being able to manoeuvre without having the dog underfoot or jumping up at you and not having toys or food ripped out of your hands. To get a tug toy off your dog, by the way, a good option is to make the toy go dead. Just grab as much of it as you can and hold it very still (sit/kneel/lean on the toy), so the dog can’t move it or rip it from you. The moment your dog lets go of the toy voluntarily, praise them and resume play. A less “physical” option is to offer a treat in exchange for the toy. Another skill that you can teach quickly and with little effort is hand targeting, i.e. teaching your dog to target your hand with their nose. Simply extend one arm, elbow straight and your palm facing the dog. Have a treat ready in the other hand (hidden, e.g. behind your back). Encourage your dog to approach and wriggle your fingers to make your empty hand a more interesting target. If your dog is still not moving towards it, place a small piece of food under your thumb to get the game started. When your dog’s nose comes close to your hand or even touches it, say a cheery “yes!” and immediately give your dog a treat from your other hand. Keep repeating this until your dog reliably approaches the palm of your hand when you hold out your arm. You can use any other item, instead of your hand, to play this targeting game. It’s fun to watch how quickly the dog learns what earns them the treat. Of course, your timing skills are crucial for your dog’s success, so this is a nifty little exercise for humans too. The seemingly simple behaviour of targeting your hand opens the door to all sorts of interesting skills. Apart from getting your dog to come to you, you can use it to move them to any place you like—onto a mat, up on the couch, off the bed, over agility equipment, around your legs, back to your side when pulling on the leash, on the scales at the vet’s office and more. The applications are endless. And all of it without using any force to move your dog! Ever had a dog underfoot in the kitchen and almost tripped or spilled something? Your dog may be keen for pieces of your sandwich to rain on the floor, but they won’t be so happy, if you spill hot coffee or drop a frying pan. Dogs underfoot can be a real health & safety hazard. So, I like to keep them at a distance when I’m busy in the kitchen. The same goes when I work with power tools or things that are dangerous for dogs. Last week I was house-minding with two delightful Labradors. One thing that became obvious very quickly was their immediate and unyielding presence whenever I moved into the kitchen. There was a body in front of me at every turn which required me to either divert or push through them. Every water droplet or speck of material that landed on the floor was subject to intense investigation. Every remotely edible crumb was sucked up by whoever pounced first. Even my exhausted “I’m just making coffee” announcements were consistently followed by hopeful eyes looking up at me before they turned their attention back to the floor. With that sort of eager anticipation, I knew just the solution. Clearly the dogs were highly motivated by food, so all I needed to do was handing out tasty treats whenever the dogs remained outside the kitchen while I was inside. I gave them pieces of cooked chicken, cheese, mashed sweet potato with tuna and, on occasion, whatever food I was eating myself. At the same time, I never gave them any food in the kitchen. This meant I had to be careful not to drop food on the kitchen floor and—in case it did happen—throw myself between the food and the dogs before they got to it. All of this works better, of course, if the dogs have a place to sit or lie on outside the kitchen. As it happened, there was a rug at the end of the kitchen area, so I didn’t even have to provide a dedicated “stay training mat”. The rug became the go-to place for the dogs to settle down on every time I entered the kitchen and we did “stay training on the fly”. Whenever I walked to the kitchen, I directed (see below) the dogs onto the rug and gave them a treat each. Whenever they followed me into the kitchen or moved into the kitchen at any stage, I immediately directed them back onto the rug—every single time. Initially, I delivered treats while the dogs stayed on the rug at a very high frequency, i.e. every 1-5 seconds. As the dogs improved, i.e. stayed on the rug more often, I decreased the frequency of treat delivery but kept it random (no fixed intervals) and sometimes gave a higher value treat or more of it. When one of them walked into the kitchen, but the other one stayed, the one who moved was simply directed back on the mat and the one who stayed received a treat. If you have practised hand targeting (see previous chapter), “directing” a dog is easy. Otherwise you can use a treat as a lure to get started. Try to transition quickly to not having food in your pointing or targeting hand though. The goal is that the dog does the behaviour first and then you bring the treat out and deliver it. The whole exercise may be easier, if you can ask your dog to lie down on the mat. A dog is more likely to “settle” while lying down rather than sitting or standing. However, this has to be either pre-trained or you could simply lure your dog down on the mat with a treat to begin with. Don’t worry about this, if it adds too much complexity for now. Your dog may even lie down by themselves after a while. Maybe you don’t mind having your dog in the kitchen or following you around, which is perfectly fine. But there will always be situations when it can be extremely helpful to have your dog out of the way or settled on a mat. Merlin & Daisy have learned “on the fly” that staying out of the kitchen pays off. As you can see, teaching your dog to wait, stay or come can be done in a rather casual way and be made to fit into your daily life. Yes, overall it can actually take longer and does not teach behaviours as reliably as carefully planned and executed dog training protocols and sessions. But, if it helps you to teach your dog anything at all and make your life—and that of your dog—easier, it’s worth a go.